Sometimes the little blessings God places before us are simple and beautiful and very personal. This morning I sat on my porch swing and started a novena, praying for the upcoming marriage of my son Joseph to his fiancée Amber. As I was praying, a purple finch alit on a branch in front of me. He was soon followed by a female and they perched together, either grooming each other or sharing food. They sat there together for the longest time before flying away and I thought how appropriate and sweet it was to observe the pair even as I prayed for Joe & Amber. Then the male returned and I don’t recognize a finch song when I hear it but he was directly in front of me, so when he opened his mouth I learned that he has more of a chatter than a song, and it’s a long burst. And that made me laugh because Joseph is a very chatty guy. So I continued my novena, praying a Hail Mary and then stopping as the finch burst forth its chatter-song and we traded off that way for quite a long time. And it was wonderful and a blessing and it was just for me alone. Because to whom would I try to describe it? With whom could I share it? Who wouldn’t roll their eyes at me and think me a little nutty? Yet without a doubt, I was given this gift by our kind and loving Father. 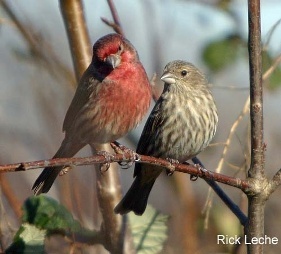 His creation – His little finches – joined me in prayer this morning and we gave glory to God, together.